Ready to create a PHR but don’t know where to begin, what to include, and so forth? Experts offer helpful pointers on how to get the most out of this online tool. 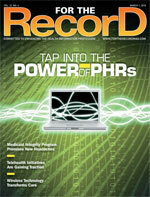 Currently, there are approximately 200 electronic PHR options available to help consumers organize their medical data. Despite the array of choices, the technology has a low adoption rate, which is unfortunate because patient data tend to be scattered among primary care physicians, specialists, hospitals, labs, pharmacies, and insurance companies, making the information less accessible and diminishing its value. Consumers who have a system to aggregate that information and track it over a lifetime can make more informed decisions. If anyone knows the value of PHRs, it would be HIM professionals, who handle such data on a daily basis. For those interested in establishing their own PHR, experts offer tips and advice on how to get the most out of this valuable tool. Another consideration is whether the tool is compatible with external devices that can upload information. “Increasingly, consumer devices like glucose meters, pedometers, blood pressure cuffs, peak flow meters, and weight scales can upload their information into a PHR,” says Scriban, who cites an example from the Cleveland Clinic, which equipped a group of patients with Microsoft HealthVault-enabled devices that allow them to upload their blood pressure info from anywhere. Clinicians access the data (with the patients’ permission) to assess how well the patients are managing their hypertension. Ultimately, the choice of platform depends on the type of information consumers will enter and maintain, which in turn depends on their need and rationale for creating a PHR. Once that rationale has been established, Jessie Gruman, PhD, president and founder of the Center for Advancing Health (CFAH), suggests asking the following questions to assess platforms: Do I understand this program? Would it be helpful to me or is it too much information? How would I use it? Are the information fields relevant to my concern? What tasks would become easier if I had my health information in an organized, electronic form? What Information Should a PHR Contain? Records of lab tests and physical exams (even if only listing the dates and providers rather than actual results) may also be included, as well as discharge summaries of the last two or three doctor visits. Since most chronic care management is done outside the clinical care setting with office visits occurring only about every six months, it’s important to track data between visits. “If you’re interested in plotting weight, cholesterol level, blood pressure, medication effectiveness, and similar data over time, look for a PHR that will let you do that,” Gruman suggests. “A one-time measure of blood pressure during an office visit is much less useful to a physician than a daily record since the last visit,” says Evans. Recently, Patient Privacy Rights released a privacy report card on six PHRs (available at www.patientprivacyrights.org/site/PageServer?pagename=PHR_Report_Card) to help consumers with the selection process. Some large companies that offer PHR platforms may provide solid security and privacy, but it’s important to also scrutinize the policies of their partners who provide additional tools and services, Katz says. “It’s a new market, so consumers have to be wary of handing over their information without thinking through the consequences,” she adds. Scriban says consumers must man the controls. “Privacy protections are all about putting the user at the center of every transaction, giving them the tools to make explicit decisions about where their data goes,” he explains. While a healthy 24-year-old may not find much value in the technology, PHRs are useful in several areas, according to Schumacher. One is to manage information for multiple family members, such as tracking children’s immunizations, following trends of ear infections, and tracking visits and outcomes across multiple doctors. Also, PHRs are useful for managing chronic diseases and treatments, including drug interactions and allergies. Finally, PHRs can be valuable when tracking wellness objectives, such as weight loss, exercise regimens, and nutrition. Employers providing PHRs to implement wellness programs to reduce the cost of insurance is a step in the right direction. However, Schumacher cautions employers to be careful in how they promote PHR information. “In a second study, we found that there were two groups with whom consumers did not want to share their PHR data: insurance companies and employers. People will benefit from wellness programs and lower insurance costs, but employers and insurance companies must proceed cautiously with PHR integration,” he says.